Baby 天使. 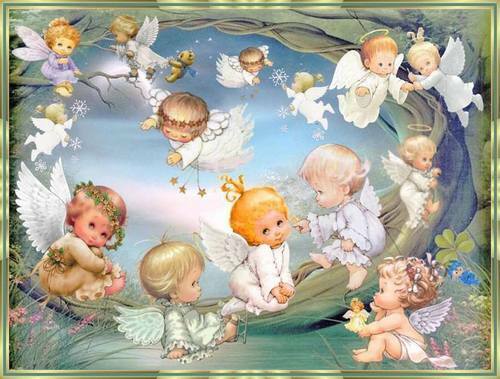 Baby angels.. HD Wallpaper and background images in the 天使 club tagged: angels baby angels art little angels. This 天使 photo might contain アニメ, 漫画, マンガ, and コミック. When i was a little girl i thought i saw a baby angel in my bedroom ! Wow! That must have awesome! I was really young and my memory doesn't serve me well.I was in bed and a bit upset as i wanted to stay up but mum said "No" through my tears i caught the sight of a small angel like figure above my head.I felt a bit scared but at the same time comforted. Hearing things like that gives me goose bumps! Yes it does,but i'm sure angels are amongst us in times of need. Maybe Heaven is like this image...beautiful and peaceful! !